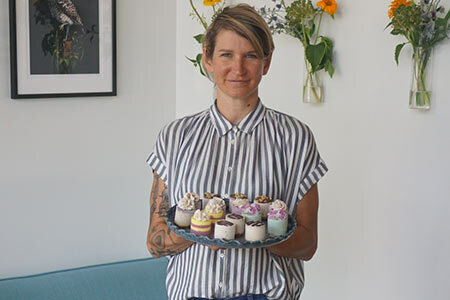 Jenn Pereau and her tiny staff enjoyed making Rawdacious Desserts, but longed to meet the people who buy them. So she opened a storefront café on 42nd Avenue. Photo by Dan Werle. In January, 42nd Avenue welcomed Tiny Moreso to its ever-growing, diverse community. The café is tucked just inside the southwest corner of the Cully neighborhood, between (com)motion & Caribbean Spice. The sunny, cozy new home to Rawdacious Desserts provides a unique, healthy option for drinks, small plates and sweets. Jenn Pereau named her café with wit. Small temptations come from her small bakery operation, Rawdacious Desserts. However, each delicacy achieves a greater degree of flavor and delight than any non-raw, non-vegan counterpart. She initiated Rawdacious Desserts, after enjoying an inspiring raw dessert at a vegan/raw food restaurant in Austin, Texas, nine years ago. Jenn returned to Portland and began experimenting with her own raw, plantbased recipes. Many of the longtime vegetarian and vegan café manager’s creations were met with enthusiastic high-fives and pats on the back. That led her to begin making individual desserts for Prasad restaurant. The taste for her desserts grew, resulting in Jenn starting Rawdacious in southeast Portland. She and her staff continued their work at The Ford Building for the next seven years, producing delicious desserts for events, local restaurants and other businesses, such as New Seasons. Jenn and her staff loved their work, but wanted more interaction with the people who buy their desserts. She met with Michael DeMarco, Our 42nd Avenue executive director, identified a suitable location and made the move. The café’s menu includes such notable options as ohQua Jazz tea, Lion Heart kombucha, New Cascadia toast with house-made almond butter, white bean tarragon dip, smoothies, juices and – of course – cheesecakes and other top-rung desserts. Rawdacious has a proven track-record of being ahead of the curve with respect to raw materials and environmental responsibility. Tiny Moreso continues that tradition by including cannabidiol (CBD) in some of the drinks, and uses paper and stainless steel straws instead of plastic. The to-go drinks are poured into glass mugs, requiring a one-time, $2 deposit before they head out the door. That encourages people to re-use them at home and take them back for refills. And, of course, no plant-based, raw, northeast Portland café would be complete without a website page dedicated to bathroom selfies. Visit TinyMoresoPDX.com/bathroom-selfies for the gallery. Special orders are welcomed for events large and small via TinyMoresoPDX. com, 503.602.4243 or in person at 4520 N.E. 42nd Ave. Tiny Moreso is open Tuesdays through Saturdays from 11 a.m. to 8 p.m., and Sundays from 11 a.m. to 3 p.m.
Jenn is looking to expand the menu to include more hot foods and longer hours in the fall, and the tiny staff of four is also interested in hiring a part-time team member. Editor’s note: Look for Rawdacious Desserts Thursdays, Aug. 2, 16 and 30 from 4 to 8 p.m. at the Cully Farmers Market.